Happy Valentine’s Day! This macro shot of an azalea combines flowers, water, and some filter effects that reminded me of a heart. Perfect for sharing on Valentine’s Day! Up on our housetop reindeer pause Out jumps good old Santa Claws Down through the chimney with lots of cat toys All for the kitty cats’ Christmas joys! First comes the stocking of Goldilocks A neat orange clock that really talks! Here is some cat grass and a blue blanket too Sunshine catnaps in store for you. Next comes the stocking of Mr. Squirt A catnip toy for the Twerp Alert Sneak in a lizard all of his own Why won’t Whiskey leave it alone? Last comes the stocking of Whiskey Lou A scratching post as tall as you A bunch of loopies and a squeaky toy Full of joy like our little boy. Oh ho ho, who wouldn’t go? Oh ho ho, who wouldn’t go? Up on the housetop, click click click! Our cats love old Saint Nick! This is a “digital art” version of a photo from last March. The two Sandhill Crane colts were just a few days old. The day was windy and cold, and Mom would occasionally sit down and create an “insta-nest” for her two tired colts. The babies would scurry behind her back and crawl into her warm feathers. That’s the realistic story behind this photo. After staring at it on our calendar for this month of January, however, Rich had a better interpretation. Rich says it’s a game of Hide and Seek! The colt on the right is hiding his eyes and counting down. The colt on the left…well, we’re not sure if he’s hiding under Mom’s head, or asking for suggestions about where to go. Better hurry up and decide! 10…9…8… I can’t wait to get out and photograph these beautiful birds again this spring! When it’s too rainy to go out, it’s time for image filters like Topaz Glow. I had fun experimenting with Glow effects. 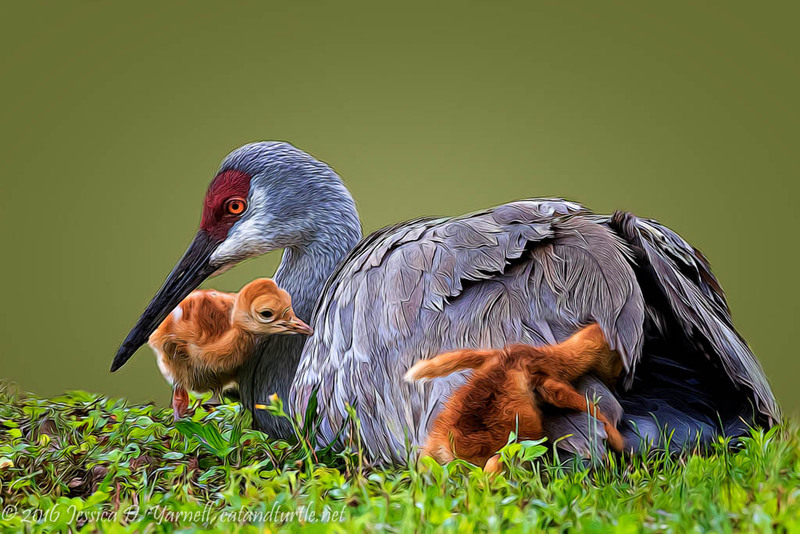 I processed some of my Sandhill Crane family pictures in Topaz Glow. What a fun program! I loved all the different effects. Which Image Made Rich Go “Wow”? From our backyard to yours…a very Merry Christmas!